The Oly Mountain Boys | Pacific Northwest Bluegrass | Blog : End of year Oly Mountain updates! End of year Oly Mountain updates! It's been a memorable year, and we want to close it out in a big way before we up the ante in 2015! 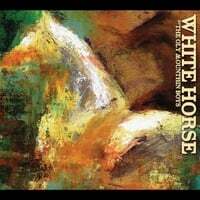 First things first - we'd like to see White Horse voted one of the Top Ten Northwest Albums of 2014 in the Northwest Music Scene readers' poll! If you agree, it takes only three clicks to vote! You can find our name waaaay at the bottom of the list. Voting closes December 12th! Thanks! Closing out 2014, we've added a new December show, at Robin Hood Pub (December 20). Looking forward, we've got a run of Tacoma shows to start out the new year, and we'll be joining The Student Loan Stringband (February 28) and Hillstomp (March 21) back home at Rhythm and Rye! And biggest of all, The Oly Mountain Boys and the Pine Hearts are teaming up to bring some of the biggest names in the West Coast stringband scene to the Prosperity Grange Hall in Oly for a two-day Steamboat Stringband Jamboree (May 8-9)! We're looking for sponsors to help fund the event - contact us if interested! Happy holidays, see you in the new year, and as always, thanks for your support!